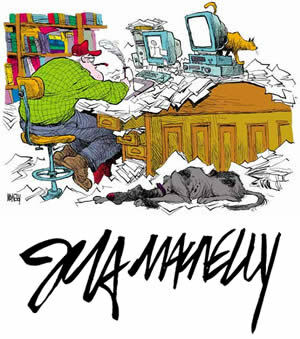 In his dual career as a syndicated political cartoonist and as the creator of the comic strip "Shoe," Jeff MacNelly earned top honors in both roles. He was paid journalism's highest compliment three times for his political cartoons, winning the Pulitzer in 1976, 1978, and 1985. The National Cartoonists Society twice presented him with its highest honor, the Reuben Award. MacNelly graduated from Phillips Academy in Andover, Mass. in 1965 and almost graduated from the University of North Carolina in 1969. While attending UNC, he got his start with The Daily Tar Heel. He joined the Richmond News Leader in 1970 and in 1977 started drawing the comic strip Shoe, which can be seen in more than 500 newspapers. The strip was named in honor of the legendary Jim Shumaker, for whom MacNelly worked at the Chapel Hill Weekly. He joined the Chicago Tribune in 1982, and continued to earn acclaim in his field, winning his third Pulitzer and being judged "best in the business" among political cartoonists in 1987, 1989, and 1993. In 1991 he won the Sigma Delta Chi National Award for editorial cartooning. On June 8, 2000, he died of cancer at Johns Hopkins Hospital. His long-time assistant, Chris Cassatt, along with his wife, Susie MacNelly and cartoonist Gary Brookins today continue his famous comic strip.